I'll be the first to admit that I don't watch a lot of television shows but when my sister told me about this new Shark Tank style show hosted by Jillian Michaels I was intrigued. I certainly do like Shark Tank! The show is called Sweat inc and it is a combination of Shark Tank, Chopped, and The Biggest Loser. Each entrepreneur pitches his/her product to Jillian and her team of judges. They are looking for the person who has the best product suited for the masses which yields the best weight loss results. The first round was based on ease of use. Jillian thought the Core Sticks were too complicated and she didn't like the high price point so she had no problem with "Chopping" that product from the competition. 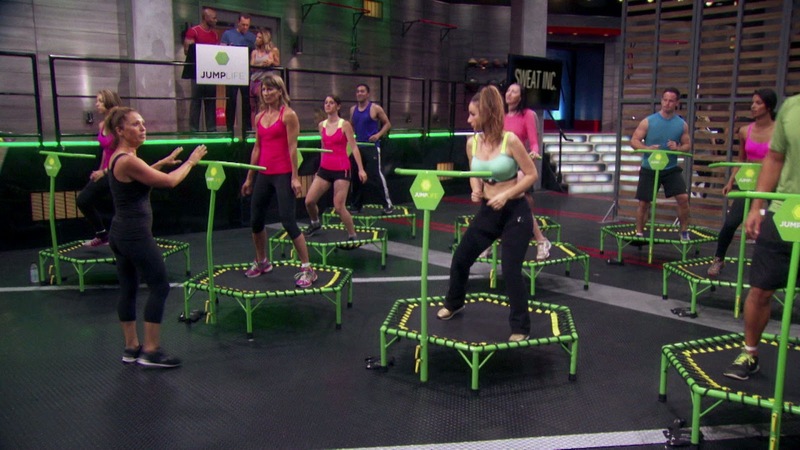 Jillian is just as tough on this program as she was on The Biggest Loser. So now there are two entrepreneurs left. Here is where they really put the products to the test. They set up two group studies. Half the people are learning to workout with the Omni Balls and the other half are learning to workout with the Jump life trampoline. Then they switch. Once both groups learn how to use each product there is an "open gym" where they go pick which product they like better. It ended up being about half and half but the scale was ever so slightly tipped to the Omni Balls. The last thing the entrepreneurs were judged on was the effectiveness of the product. Each entrepreneur had a guy and a girl train with them for a specific period of time. Then at the end of the time frame they had to weigh in and calculate percentage of body weight loss. In the end, The inventor of the Omni Balls won the competition. I really liked the Jump Life and I could see that taking off as a class at a gym. I could tell Jillian really liked the idea too except that the entrepreneur behind the product did not have good management skills. Jillian wanted her to market some children's class and to contact some mommy bloggers and she kept making up excuses why she hadn't done it. I liked her product but lost a bit of respect for her once she kept putting off the tasks that Jillian gave her. Have you seen this program? If so, what do you think of it? All pictures are from Google Images. It comes on Tuesday nights on Spike TV. I had that info in my post but it must not have saved properly when I edited it. I love Shark Tank but have missed this show. 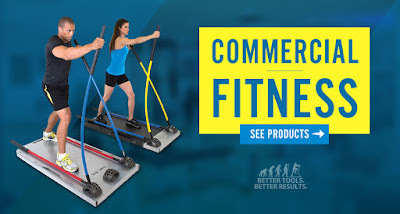 It sounds like a fun one since it includes exercise products and Jillian Michaels is always fun to watch. I haven't seen this! But I'm a Jillian AND Shark Tank fan, so I'd probably like it! I like Shark Tank, too! This show sounds fun - I'll have to look for it. And while I can't jump on hard ground anymore thanks to my bum ankle, I'm super intrigued by that mini trampoline with the hand bar! Oh, I hadn't heard of this show. I love Shark Tank so this sounds really interesting. I'll have to look for it. This sounds cool! I've never watched shark tank but I do like Jillian! I haven't heard of the show at all. I'm lucky to be watching all of my shows, and another one starts Thursday. I definitely use my DVR for stuff. I have not but it does sound like something I would like! I just passed it last night & it went right to commercial & ended up turning it over & forgot about it - DANG IT! I'd be all about this show! I haven't seen this program, but I do like Jillian Michaels. I've got to check it out! I've never seen this, but I do like Jillian Michaels and am a huge fan of both Chopped and The Biggest Loser. This sounds like something right up my alley! I think I would enjoy this show! Thanks for the info. I haven't heard of this before, but it sounds like something I would love. I have my own mini trampoline and it's such a good workout, and really fun too. I would love this show! What channel is it on? I am not usually a big reality TV person, but this looks like a show I would get sucked into. Cool! That sounds like a really fun show. Oh wow! I find Shark Tank to be absolutely fascinating so this show would be right up my alley! What channel is it on and at what times??? Ohhh, this looks pretty cool! What channel is it on?? This looks like a fun show, is it on cable? Why this is a very special 5k. The Advantage of Running the Day AFTER Halloween!